Crizotinib is inhibitor of the c-Met kinase and the NPM-ALK. Entrectinib, also known as RXDX-101 and NMS-E628, is an oral small molecule inhibitor of TrkA, TrkB and TrkC, as well as ROS1 and ALK, with high potency and selectivity. KRCA-0008 is a potent and selective ALK/Ack1 inhibitor with IC50 of 12 nM/4 nM for ALK and Ack1 respectively; displays drug-like properties without hERG liability. CEP-37440 is a novel potent and selective Dual FAK/ALK inhibitor with IC50 s of 2.3 nM (FAK) and 120 nM(ALK cellular IC50 in 75% human plasma). LDK378 dihydrochloride is potent inhibitor against ALK with IC50 of 0.2 nM, shows 40- and 35-fold selectivity against IGF-1R and InsR, respectively. PF-06463922 is a potent, dual ALK/ROS1 inhibitor with Ki of <0.02 nM, <0.07 nM, and 0.7 nM for ROS1, ALK (WT), and ALK (L1196M), respectively. AZD-3463 is a ALK/IGF1R inhibitor. 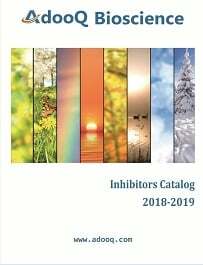 CH5424802 is a potent, selective, and orally available ALK inhibitor with a unique chemical scaffold, showing preferential antitumor activity against cancers with gene alterations of ALK. ASP3026 is a novel and selective inhibitor for the ALK kinase. ASP3026 potently inhibited ALK kinase activity and was more selective than crizotinib in a Tyr-kinase panel. ALK inhibitor 2 is a novel and selective inhibitor for the ALK kinase. LDK378 is a highly selective, orally bioavailable and ATP-competitive small molecule inhibitor of ALK (Anaplastic Lymphoma Kinase), a receptor tyrosine kinase considered to be an important lung cancer drug target. CEP-28122 is a highly potent and selective orally active inhibitor of anaplastic lymphoma kinase with antitumor activity in experimental models of human cancers.